The man with the heavenly beard is back for another acapella. This time he performs Ken's Street Fighter II theme. Get ready for some Smooth McGroove and his cat. The popular YouTube sensation has made another hit. 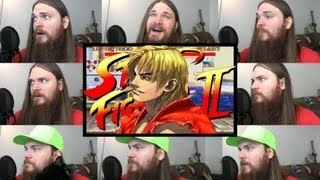 Here he performs an acapella version of Ken's Street Fighter II theme song. Of course this means only McGroove's voice is being used. As with all of his videos, McGroove edits clips of himself performing while gameplay footage takes the center.